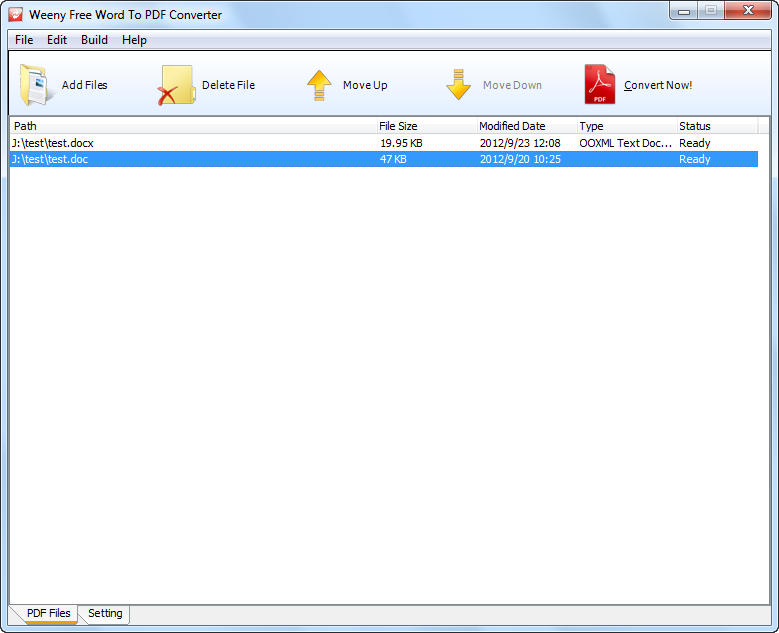 A free Word to PDF Converter software to convert DOC or DOCX to PDF document. Free Word to PDF Converter is a free PDF converter software to batch convert Word document to PDF document. Free Word to PDF Converter's efficient interface make it easy to convert different file formats including doc, docx, rtf, txt and htm to PDF quickly in batch mode at one time. This software offers a simple and clean channel to convert word to PDF with high quality. The conversion retains the layout of the doc just the way it is in the original format. Additionally, Free Word to PDF Converter can add watermark, passwords, restrictions and certain information such as title, subject, author or keywords to the output PDF documents. Please note Free Word to PDF Converter doesn't support DRM protected Word documents. Free Word to PDF Converter doesn't require Microsoft Office or Adobe Acrobat Reader installed. Free Word to PDF Converter doesn't depend on any print driver so it will not install any print driver on your computer. Free Word to PDF Converter works on Windows XP, Windows Vista, Windows 7 and Windows 10, both 32-bit and 64-bit versions. Click the download button above to download Free Word to PDF Converter full version. Full version means the file is complete and doesn't require Microsoft Office or PDF printer to run. Full version also means Free Word to PDF Converter software doesn't have any watermark, nag screen, time expiration or function limitations. The command line program comes with Free Word to PDF Converter 2.0 and later versions. Your suggestions are welcome. /? List all command line options. /v Show Free Word to PDF Converter version and copyright information. /source <Filename> <Filename> <Filename> Select source Word files. Separate filename with blank. The file format can be DOCX, DOC, RTF, TXT, HTM or HTML. For example: word2pdf.exe /source "c:\test\sample1.docx" "c:\test\sample2.docx" "c:\test\sample3.docx"
/target <Directoryname> Set target directory. The default target directory is "c:\My PDF". For example: word2pdf.exe /target "c:\My PDF"
Sample: the command below will convert three word files sample1.docx, sample2.docx and sample3.docx to PDF files in directory "c:\My PDF". 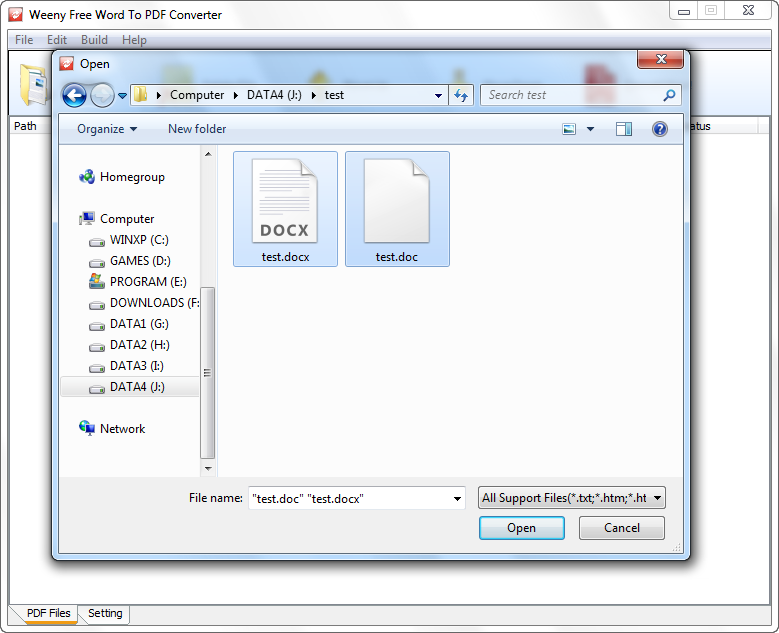 word2pdf.exe /source "c:\test\sample1.docx" "c:\test\sample2.docx" "c:\test\sample3.docx" /target "c:\My PDF"
Weeny Free Word to PDF Converter 2.0 is a brand-new version with many new features and upgrades. It's strongly recommended to update your Weeny Free Word to PDF Converter software to the latest version if you are still using version 1.x. The Free Word to PDF Converter command line program is finally available on version 2. Sometimes you may need to convert Word to PDF in background silently without any windows pop up, you can use our command line program to do that now. The command line program and the original program are integrated into one executable file, so the installation file of 2.x is only slightly bigger than the installation file of 1.x. We have updated the DOC/DOCX to PDF conversion engine. The conversion result in version 2.x is better than result in 1.x. 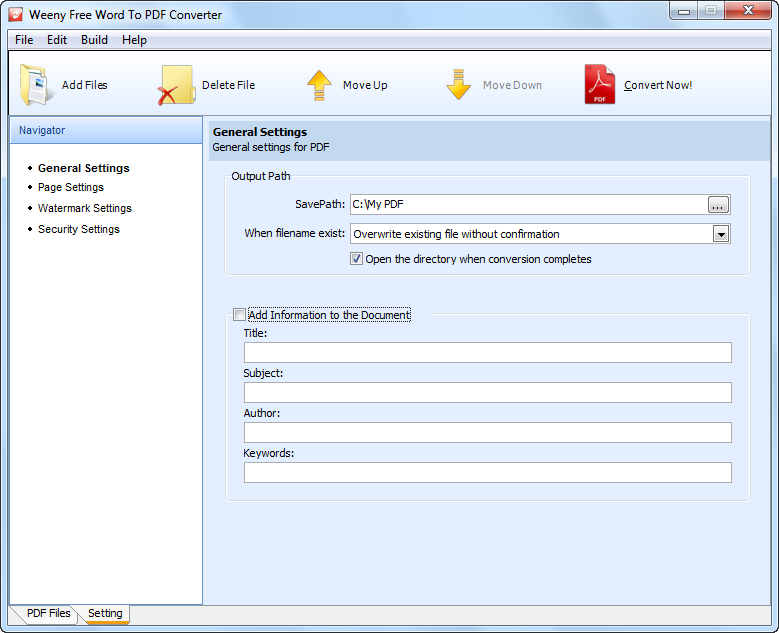 Weeny Free Word to PDF Converter 2.0 fully supports Windows user account without administrator right. Usually you should have access to the administrator account on your home computers. However you may not have full administrator privileges on your company computers. Since this is a business software, we decide to recode the parts that needed administrator right to run. You may be accustomed to drag and drop files from the desktop onto a software to view, edit, convert, etc. But unfortunately, you've been unable to drag and drop files onto Weeny Free Word to PDF Converter 1.x. Luckily, beginning with version 2.0, this issue is solved. You can directly drag and drop a file or files from the desktop or Windows Explorer to this software, then click "Convert Now" button to start converting. Easy to use - A couple of clicks to finish word to PDF converting. Free to use - 100% free to download, install and use, no watermark, no limitations and no extra fee. Free Word to PDF Converter - Convert word document doc and docx to PDF document for free. Support many document formats - Support converting document formats doc, docx, rtf, txt and htm to PDF file. Add watermark - Add image watermark or text watermark to the output PDF document. Set PDF password - Set PDF user password or master password. Set PDF restrictions - Set document restrictions including printing, changing the document, content copying or extraction, authoring comments and form fields, form field fill-in or signing, content accessibility and document assembly. Set properties - Set certain information such as title, subject, author or keywords to the output PDF documents. Standalone application - Capable to effectively perform without Adobe Acrobat Reader, Microsoft Office or any PDF printer drive installed. We recommend using Microsoft Office with "Microsoft Save as PDF or XPS" add-in to convert Word to PDF file. This is the official way from Microsoft to convert word document. However if you don't have Microsoft Office installed and need a free alternate software to convert PDF from Word file. Weeny Free Word to PDF Converter is the software you should try. Weeny Free Word to PDF Converter is an application that allows you to convert Word files to PDF. At the bottom of the interface you find a settings tab that offers you a wide range of functions. You can choose the location where you would like to save the converted files. A special attention should be granted to the 'when file name exists' function for not overwriting the existing files without confirmation. You can also select your page preferences. You can choose from an A4 format page to an A5 or A3. Other possible page sizes are also offered. You can custom change the page size, modify its width or height, or you can simply embellish it. What I like most about this program is that it allows you to protect your newly created files. This way, you can enable a password access to your converted document. I believe this is an important aspect since it allows you to keep your information safe. Likewise, it can help you restricting access to foreign people or family members. You won't find a help icon in case you will look for it, but I believe that you will not need it. The program offers all of its functions in a straightforward way. You can understand and use it without problems. I am pleased with this program. It is free. It works well and it does not require too much disk space. Such a good software. it help me all in my office or personal work. Good, great, and best software for use. Good, great, and easy software for everyone. it is remarkable and good for office or any type of work. DOC and DOCX documents can create problems when you try to open them on other computers, although they have rich features and extensive text options. For instance, you cannot open created files on older versions of Word. A good idea would be to convert them to a more portable format, such as PDF. Weeny Free Word to PDF Converter is a powerful tool that can convert DOC, DOCX, TXT, HTML, RTF and HTM files to PDFs in no time. In addition, this is a standalone program, meaning it does not require Adobe Reader or Word installed. The application can help you convert Word and other text files, such as TXT or HTML to PDF in no time. You can batch convert the files, by simply selecting them. Furthermore, you can add some information to each converted file, such as title, subject, author or keywords. Your PDF files can be custom sized, as the program allows you to change the page size to a predefined value, such as A3, A4 and A5, or to a custom width and height. You can also change the orientation of the page, whether to landscape or portrait. Weeny Free Word to PDF Converter allows you to add certain watermarks to your output files. They can be either text or image watermarks, and they can be freely moved on the page. Additionally, you can set certain page spaces and offsets, in order to better align the text. One of the strongest features of the application is the fact that you can encrypt PDF files, by adding a password protection. This way, only certain users will have access to your documents, whilst others will not even be able to open or print them. Weeny Free Word to PDF Converter gives you a few extra features besides Word document conversion, such as watermarks and password protection, making your output files look professional and clean.